1 What do you call a cycle that is clear and flows? No, it is not an invisible bicycle floating down the Mississippi River! It is the Earth's water cycle! For millions of years, Earth has recycled or reused its water. Think about it; you could be taking a bath in the same water used by your grandparents when they were kids. Let's look at how the Earth reuses its water. 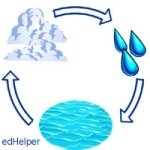 2 The Earth's water cycle has three main stages or parts. They are evaporation, condensation, and precipitation. These stages repeat over and over again. However, the water cycle does not repeat overnight. In fact, the whole cycle can take a long time. The reason it's called a cycle is because the water goes from the Earth, through the air, to the clouds, and back to the Earth again. This pattern is like a spinning wheel on a bicycle. 3 Ocean water is an important ingredient in the water cycle. During the first stage, evaporation, ocean water is heated by the sun. This causes the water to evaporate or change into water vapor (gas). The salt from the water is left on Earth. Don't worry, there are not empty oceans lying around! Since the water cycle is always "spinning," the oceans are always full. After the water changes into gas, it rises into the air. We also see examples of evaporation when the sun dries a puddle after it rains or when we let the picture we painted dry on the table.